September’s Bureau of Labor Statistics data show that the SF-Oakland-Hayward region had job growth in every category except information and education/health services, which were down just slightly. Unemployment also dropped slightly. 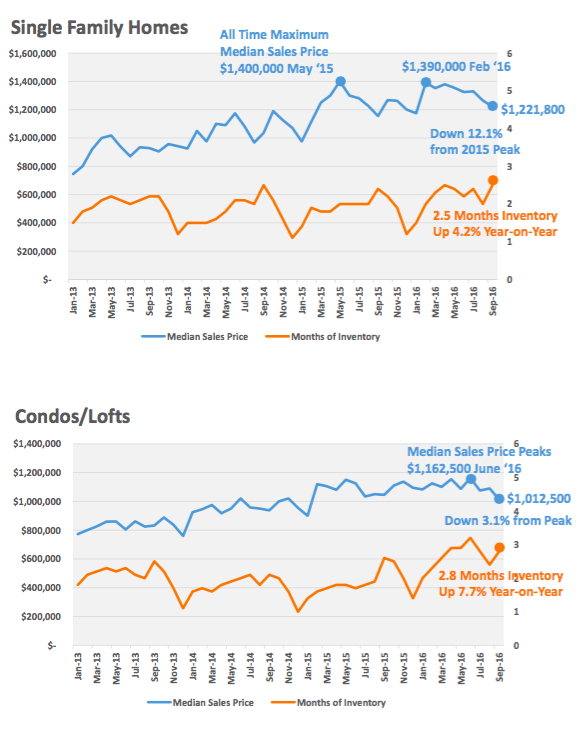 These are both positive economic indicators which should drive increased housing demand. Yet the San Francisco real estate market sales data indicate that buyers continue to step back from purchasing in the numbers and at the prices they had been. Single family home sales prices are off 12.1% from this year’s peak of $1,390,000 in February. They are also off 12.7% from the peak of this multi-year up-market cycle of $1,400,000 in May, 2015. 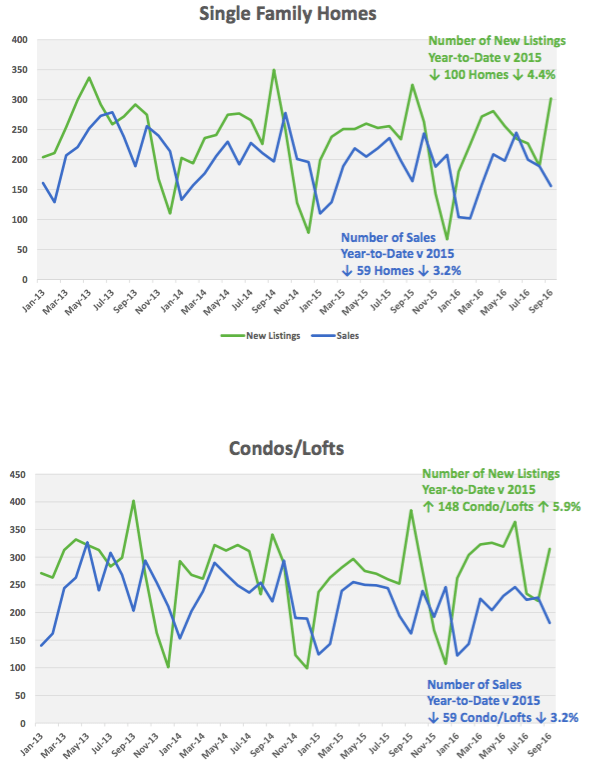 The condo/loft market is also off 12.1% from its June peak of $1,162,500. The number of sales in September of single family homes was the lowest September for the past 10 years, following an August that was also the lowest August for the past 10 years. Year-to-date, the number of single family home sales is down 6.5% compared to 2015, and the fewest sales since 2009. 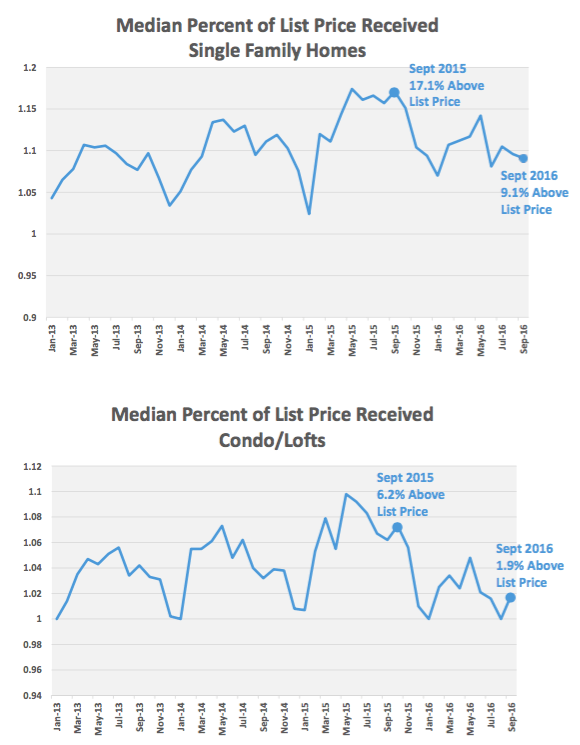 Likewise, the number of sales year-to-date in condo/lofts is down 3.2% compared to 2015, and the lowest it’s been in over 10 years. We attribute the continued downward shift to a combination of buyer fatigue with rising housing prices as well as to uncertainty with the upcoming election.